This is a flashing guide for Samsung galaxy S7 & S7 edge if you are looking to restore your device software, upgrade, or downgrade the android version on your phone. You can follow this tutorial to flash any model of the galaxy S7/S7 edge (Global, Verizon, T-Mobile, AT&T, Sprint, US Cellular, Canada, ...). Charged Samsung galaxy S6 or S6 edge. USB cable and Windows PC. Download, install Samsung driver or Smart Switch. Download, unzip firmware file and odin. Double-click odin3 tool, click BL and navigate to BL_xx, AP and navigate to AP_xx, CP and navigate to CP_xx, and CSC and navigate to HOME_CSC_xx. Go to settings, Lock screen, Protect encrypted data or secure startup and select require PIN. Put your phone into download mode (Vol Down+Home+Power) then Vol Up. Connect your device to the computer and wait until you get a sign in ID:COM section and "Added" in message box. Click Start and wait few minutes until you see "PASS!" in odin. If your phone stuck in bootloop, reboot your device into recovery mode then choose factory reset. Do not disconnect the USB cable while flashing process is running. 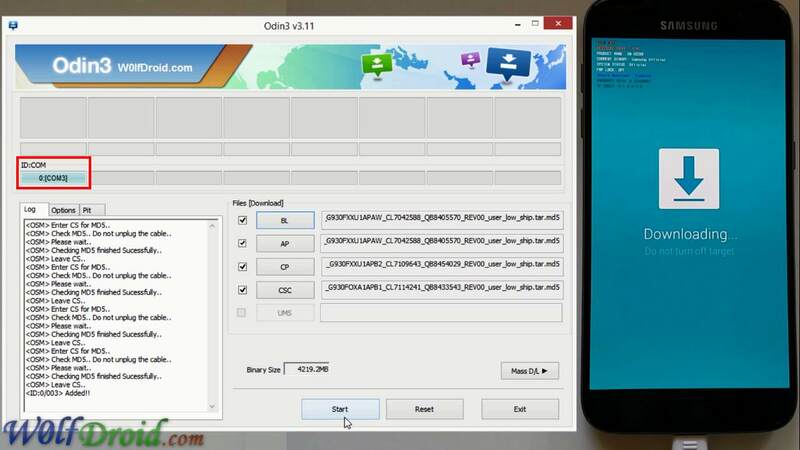 Install Samsung Mobile Driver or Samsung Smart Switch if you don't see a sign in Odin. Flash your device at your own risk. Flashing official/stock firmware won't increase the binary flash nor KNOX WARRANTY VOID counter and won't cancel the device's warranty.